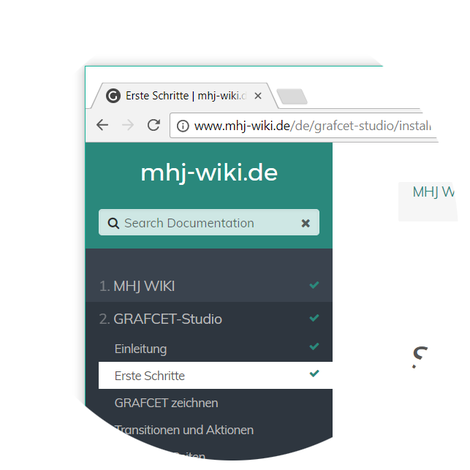 Design a GRAFCET - GRAFCET erstellen, simulieren und in ein Gerät übertragen. For training, construction, mechanical engineering and industry. 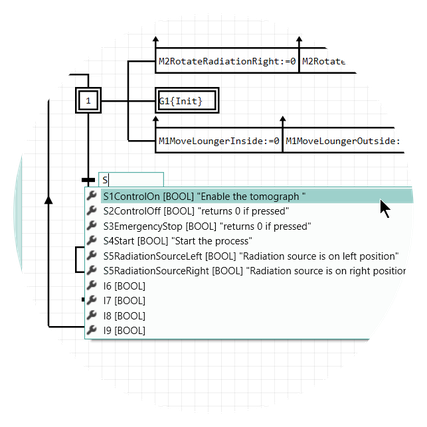 With GRAFCET Studio, you can draw a GRAFCET chart and then simulate it. Change the value of a signal and watch the reaction in the GRAFCET chart. 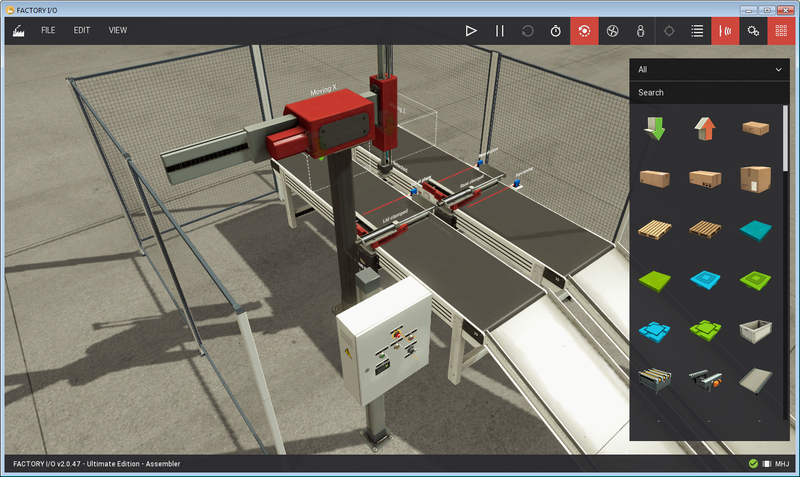 In order to simulate more conveniently, it is possible to connect a virtual 2D or 3D machine. 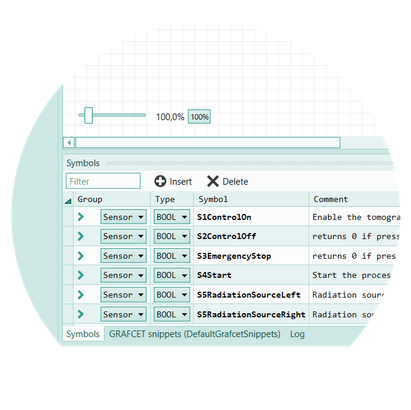 With GRAFCET-Studio, the DIN standard 60848 becomes a cross-platform programming language: at the push of a button, you can transfer the GRAFCET into a Device (S7-300,400,1500,1200, Arduino Due, Raspberry Pi). First define the symbols (Motor1, EmergencyStop, etc.) that you want to use in the GRAFCET chart. This has the advantage that the GRAFCET is clearer and easier to understand. Auto-completion helps you enter symbols faster. Enter the first letters of the symbol you want to use and then press [CTRL]+[SPACE]. A window with the appropriate symbols opens in which you can quickly select and insert the correct symbol. Select the step in which you want to insert an action and click on the desired action type, which is then inserted at the correct position. With this method "Drop at Selected Position" you can draw step chains very quickly. Alternatively, you can move the desired GRAFCET element to any position by dragging and dropping it. 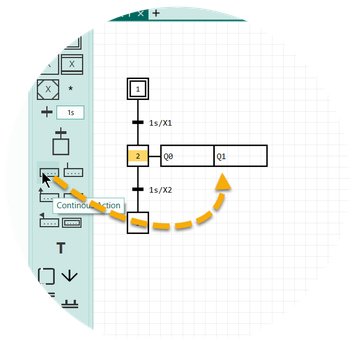 You can also select and duplicate existing elements in the drawing area. This is also a quick method of drawing. 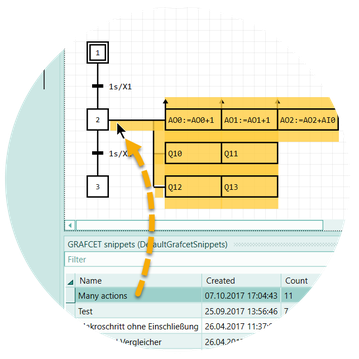 Use the GRAFCET Snippets window to build your own library. 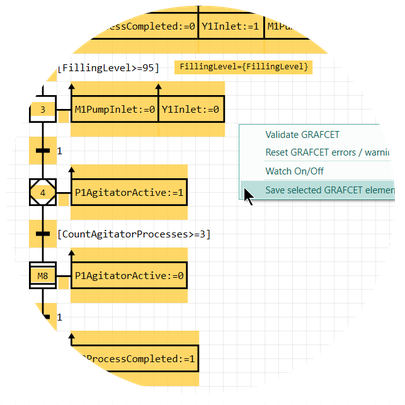 Save any GRAFCET constructs as objects and paste them back in at any position. The user interface of GRAFCET-Studio is completely vector-oriented. 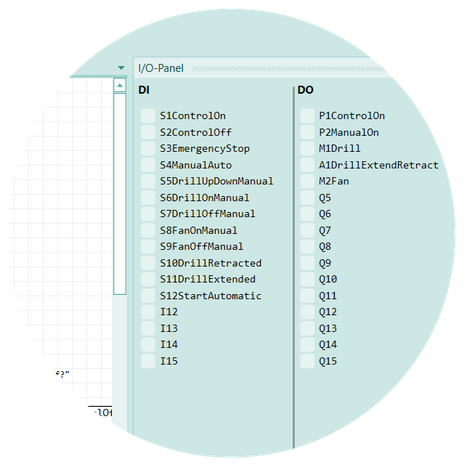 The UI including the GRAFCET plan can be scaled without loss of quality. GRAFCET-Studio is displayed in every resolution in the best possible way and with pin-sharp clarity. This is especially noticeable with high-resolution 4K monitors. You can change the font size of the freely placeable comment fields and change the background color. If you write a symbol in curly brackets, the current value is displayed instead. Save the GRAFCET plan as an image file. You can save the entire GRAFCET plan or individual parts as a high-resolution, transparent PNG image. You can insert the image into your (MS-Word) document and have a high-quality representation of the GRAFCET plan. 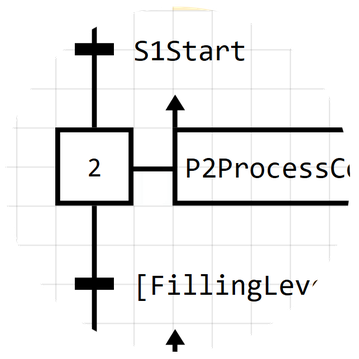 With the I/O panel, the states of the digital and analog inputs can be changed in the simulation. The outputs (digital and analog) can be monitored here. 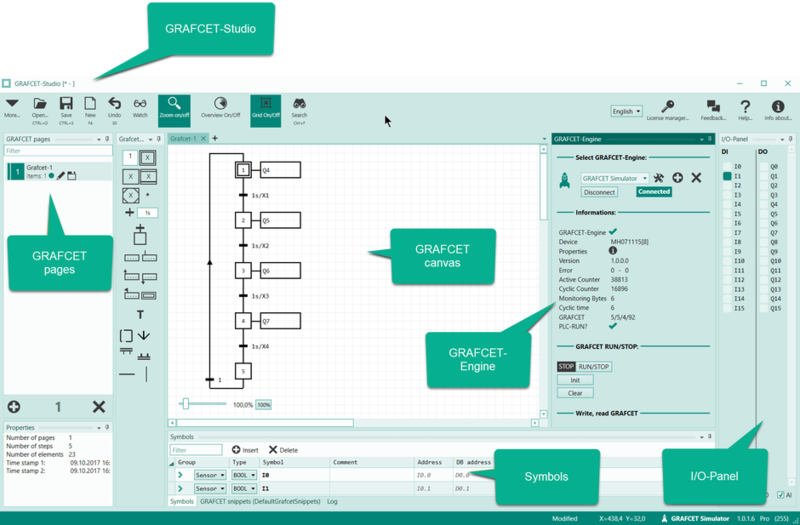 GRAFCET-Studio can be connected to SPS-VISU, PLC-Lab-Runtime and FACTORY-I/O. 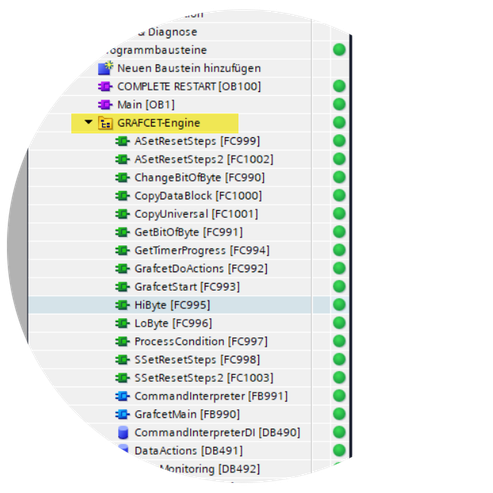 If it becomes too complex to manipulate the sensors manually, the virtual machine is responsible for supplying suitable sensor data. 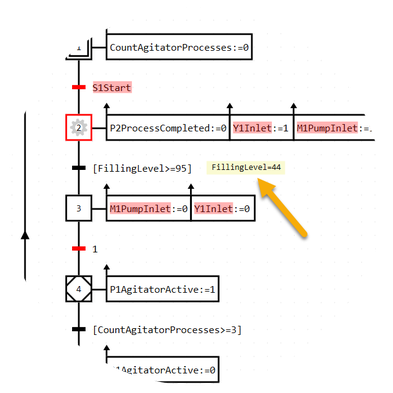 This makes it possible to simulate even more complex processes very well. 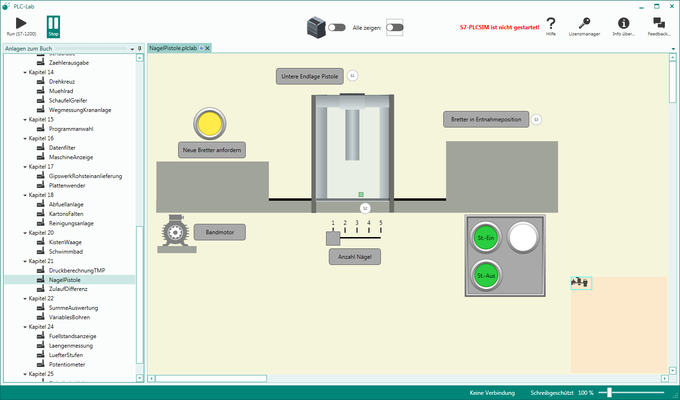 GRAFCET-Studio users receive many finished, virtual systems via PLC-Lab-Runtime for training purposes. 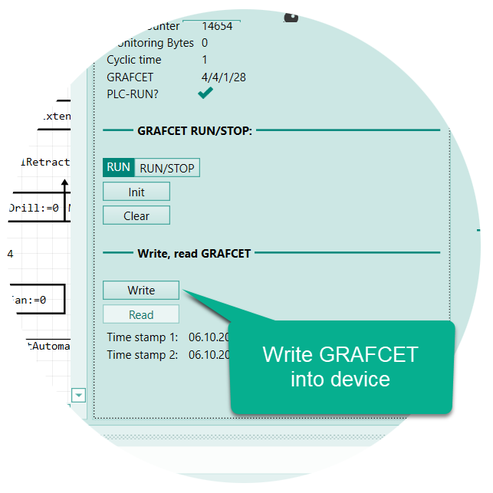 Use from now on GRAFCET as a PLC programming language. At the push of a button, you load the GRAFCET logic into a controller. 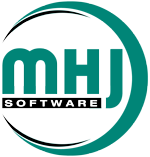 Currently supported: SIEMENS S7-300/400/1200/1200/1500, Arduino Due and Raspberry PI. 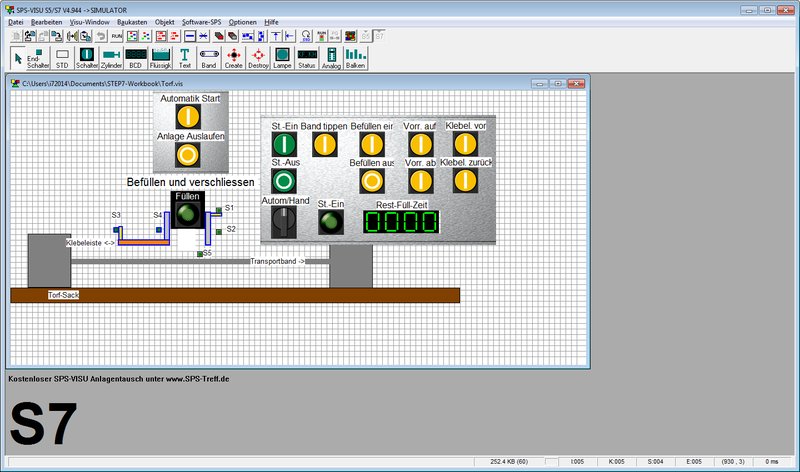 This makes GRAFCET Studio the first cross-platform PLC programming system. 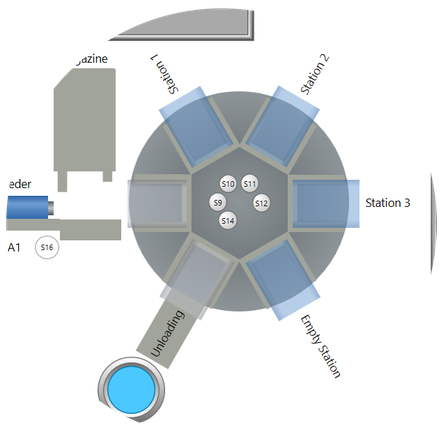 In addition, you can now for the first time program a S7-1200 or S7-1500 without TIA PORTAL. In the following video you can see how to create a step sequence and transfer it into an S7-1500. The next video shows an S7-1200 programmed with GRAFCET Studio. The S7-1200 controls the "Fischer-Technik" model "Taktstrasse". 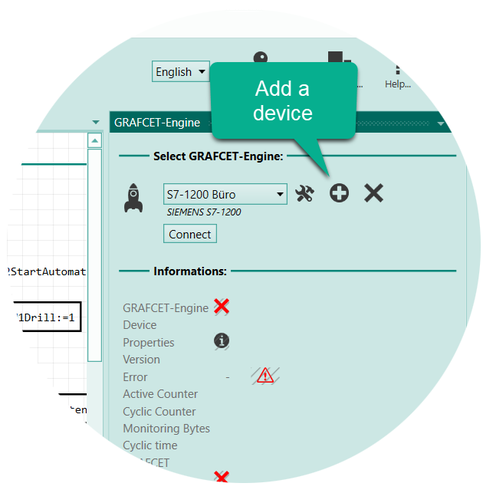 The window "GRAFCET-Engine" makes a new (external) GRAFCET-Engine available that is installed in a device. In the case of a S7-1200, all you have to do is to set the IP address and you can program the controller with GRAFCET Studio. If the connection parameters (IP address) are correct, a connection can be established. The picture on the left shows an active connection with a VIPA MICRO-PLC (S7-300 compatible PLC). The "Write" button writes the GRAFCET to the connected device. This usually takes less than 1 second! 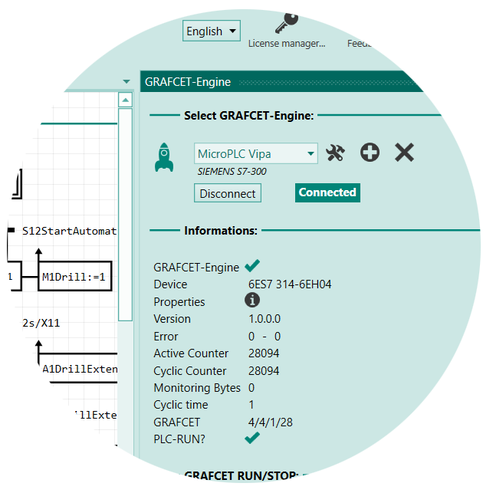 Read here how to install the GRAFCET-Engine in an S7 controller. You will also find useful GRAFCET examples for practical use. Request your free demo version of GRAFCET-Studio here. With the 30-day demo version, you can use the Pro-Edition of Grafcet-Studio without limitations. Don't miss any news about GRAFCET Studio.